You could feel the excitement as the kids tried out their new clothes repeatedly. My younger brother and his family will be visiting on Sunday so we were busier than usual all through the preceding week culminating in wifey working a half day on Friday so that we can attend a pre-confirmation event organised by the kids’ school and also do the grocery shopping for her to devote Saturday to cooking assorted dishes. The entire house was cleaned up and I set up the 4×4 gazebo in the patio for outdoor activities. We bought a new coffee table. 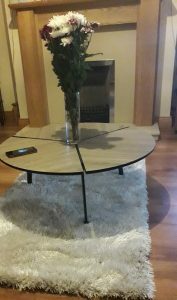 The trendy low type and I carefully placed it at the centre of the living room with a simple glass flower vase on top of it creating an ambience which was amplified by the gentle aroma from the white and purple daisies I bought for Mothers’ day the previous week. The forecast looked good. There will be a few showers as usual but mostly sunny so I planned a jaunt to the historic port town of Kinsale where I had booked a boat cruise and dinner in a Chinese restaurant we visited last spring. The buzz was palpable and we were ready! That was till the next morning. I was to go and receive my brother at the airport, lead them to the hotel before joining my family at the church. So naturally I woke up with a bounce and picked up my phone to call him on WhatsApp. “Could it be April fool?”, I wondered. But then my brother’s birthday just passed and it was on April fools day! “So what will happen?”, I asked faintly hoping for a laughter emoji in return. I was disappointed, a fuming red emoji dropped with the reply instead. They had arrived at the Stansted airport five minutes after departure. I had flown Ryanair enough to know that the airline has only one daily flight to Cork and using another airline would be outrageously expensive. I wouldn’t contemplate that myself. And even if they could be rescheduled for the next day, it would be fruitless going back all the way to East London, return the next morning and still risk missing the confirmation scheduled for 10 am on the same day. Moreover, they planned to fly back to London on Tuesday. I could relate to all I was reading and being a frequent traveller I found myself on a guilt trip for not informing him to leave for the airport by 3 am. Oh yes, it is not uncommon to see passengers hurdled on the floor overnight at Stansted just to ensure that they catch their flights. My wife and the kids almost missed their flight kids flying through Stansted airport last year and in January 2011 my family missed a flight back to Cork as we were held up on the M25 for over 3 hours. We have since learnt not to leave London in the mornings if we had a choice. The first flights often depart on schedule leaving no room for lateness. These days I’m always at least 2/3 hours early at the airport. My mum goes 5 hours before the scheduled departure time. If you ask her she ‘ll tell you that airports are not only beautiful but always busy. There are many people and activities to pass the time with and it is true. But having lived in London for the better part of the last 2 decades my brother had become more Brit than Nigerian. They are always punctual. That explains why I didn’t feel the need to sound a note of warning. When he informed me that the next available flight was on Tuesday I knew there and then that the trip was practically over. There was little anyone can do but plan for another visit. I ‘ve missed too many flights in my lifetime to get overly worried about such disappointments. The only thing he could do now was to cut his losses. Cancel the hotel and car rental bookings and see if there ‘ll be any refund. While still lying on the bed I could hear my wife moving around in the kitchen downstairs. I didn’t know how to tell her let alone the kids. But I had to so that she ‘ll stop the cooking. The refrigerator was already filled to the back and the clanking of pans meant the cooker will be busy. She was aghast at the news, almost speechless. The only thing that managed to escape her lips in disbelief were OMG! My brother’s 5-year-old son was already crying at the airport I had learnt. He was the only one old enough to know they weren’t going to see their cousins as planned. Poor boy! My kids were all grown, I will have all teenagers in the next seven months so their disappointment will be harder to contain. Well, you guessed right. They all cried but we managed to console them with the promise that the visit has been rescheduled for summer. It wouldn’t be too long after all, and there will be plenty to eat all week. The confirmation was gracious and my twins looked angelic in their attire. We had lunch in our newly discovered Italian restaurant called Nostra. And oh before I forget. My daughter took Diana for her confirmation, a befitting name for a princess while her brother chose Mark. Lovely names I must say, and that will be making it four names each which may be too long for the boxes provided in JAMB forms. But they won’t be writing JAMB anytime soon, so it ‘ll be wiser to focus on the more immediate problem. No thanks to the London motorway I gained an extra pound or two in the past week in a bid to ensure that the dishes were not wasted. That would have been injustice to wifey. So as I wrap it up it is either some overtime in the gym or a few laxatives to the rescue. The latter perhaps? Have a great week! 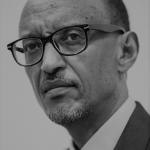 Previous article Can Kagame be ‘unAfrican’ in 2024?